Valentine’s Day is still two weeks away, but my internal pastry and chocolate clock is already ticking. It’s telling me that it’s time to be in full chocolate-mode. That’s 100% ok with me and this time of year makes me almost as giddy as Christmas time. Valentine’s Day means chocolate everything. I can’t help but feel enamored by the holiday with all its frilly decorations and glamorous packaging. As much as I try to resist the corny and obvious commercialism of the day, its charms win me over. That being said, Valentine’s Day is not the day that my husband and I celebrate our love. That’s every day. Every day we make the choice to love, respect, and learn from one another. We try and show our appreciation to one another regularly and make an effort to support one another daily. Our friendship is paramount and there’s no one we would rather be spending time with than one another. Therefore, the big V-Day isn’t really a romantic holiday for us. It’s usually the day that we eat chocolate together. This year will be no different, except now I’m going to also share them with you. 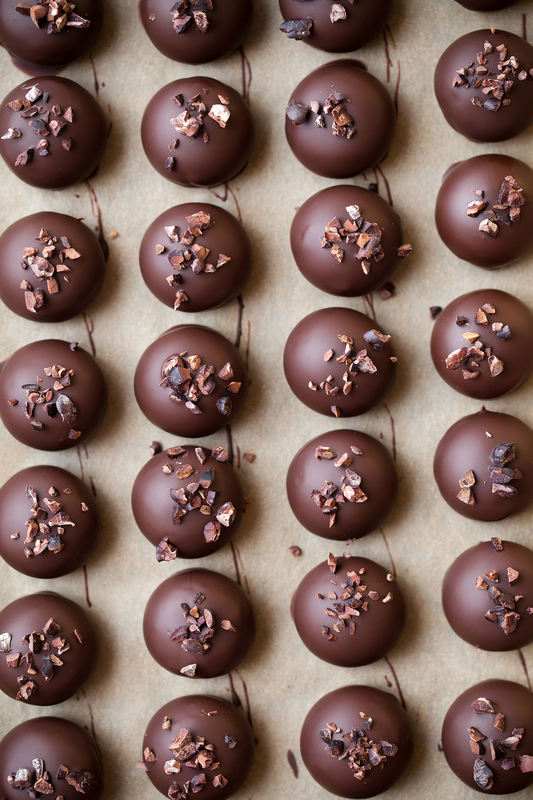 Cocoa Nib Truffles are on the dessert menu this Valentine’s Day. Silky dark and milk chocolate ganache enrobed in dark chocolate with a sprinkling of cocoa nibs. Delicate, creamy, and with the softest crunch from the cocoa nibs. The slight snap of a thin chocolate shell when bitten into is sheer pleasure. There’s a reason that chocolates are gifted on this romantic holiday. Eating a truffle is a special experience. Special enough to set aside some time to create these for the sweethearts in your life. When making truffles, it’s important to use the best quality chocolate. The main ingredient in truffles is chocolate. Therefore, the truffles will only taste as good as the chocolate being used. Cheaper chocolate tends to be overly sweet and it dulls the tongue to flavor. It’s also thicker and more viscous (from all the sugar and additives). A high quality chocolate will flow and shine. It’ll have “personality” made up of subtle flavor notes of wherever the chocolate beans have been harvested from. The flavor will be layered, deep, and complex. Similar to excellent coffee and wine. Most specialty food stores supply a variety of high quality chocolates: Guittard (American), Callebaut (Belgian), or Valrhona (French- a personal favorite). It may take a few phones calls or a Google search to find them, but it’s worth it. Dipping truffles requires the use of tempered chocolate. This means you will be tempering the chocolate in this recipe. Stay with me here. It’s a simple process of melting and heating the chocolate to a specific temperature. Coating the truffles at this specific chocolate temperature is what provides the shell with a firm setting and snap. 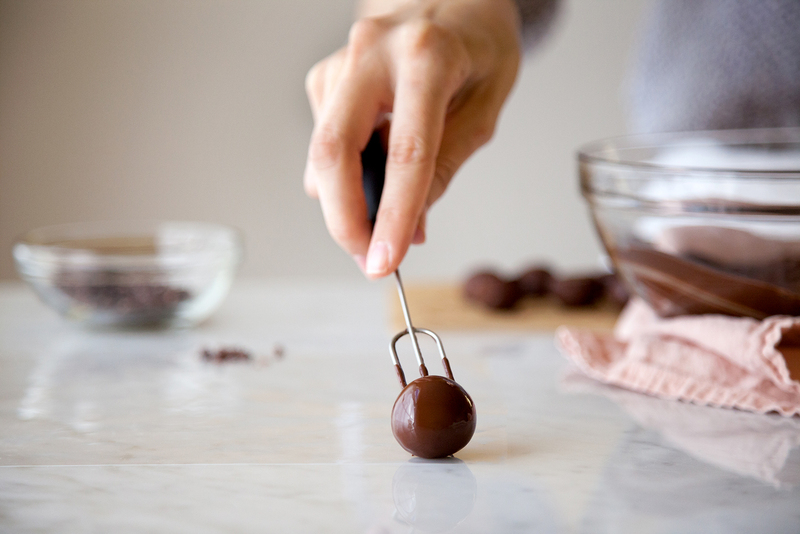 The finished truffle can be easily picked up and handled without melting when touched. Encasing the truffle in tempered chocolate also keeps it fresh much longer. Not to mention that beautiful sheen. At the end of this post, I’ve created a ‘How To Quick Temper Chocolate’ guide. It’s a variation of the traditional way of tempering chocolate, only a little faster. There are several ways to temper chocolate. Just ask any chocolatier or pastry chef. They all have their preferred method with personal variations, tips, and “rules” that they apply. It’s all learned by experience and there’s always room for new ideas. If you’re new to chocolate tempering, a positive attitude and willingness to learn is helpful. Take your time, have a kitchen thermometer ready, and relax. Once you’ve tempered your first batch of chocolate, you’ll realize that there was nothing to fear. In full disclosure, I’ve intentionally been holding off on sharing a truffle post on Now, Forager. I was unsure if anyone would want to learn how to make them. Most people, who are unfamiliar with working with chocolate, are very intimidated by it. This tends to make them fearful. In turn it makes them frustrated, which usually expresses itself in anger. They lash out with comments such as, “This is a waste of time. It’s too hard” or “I’d never make these myself. Too time consuming.” In their discomfort, they fail to realize that truffles are something anyone can create. You just have to WANT to create them. The comments should say, “I’m afraid of making these because it’s out of my comfort zone” or “I don’t care about chocolate, so I’m not interested in the effort it takes to make these.” Being self-aware will open up new exciting challenges and experiences. 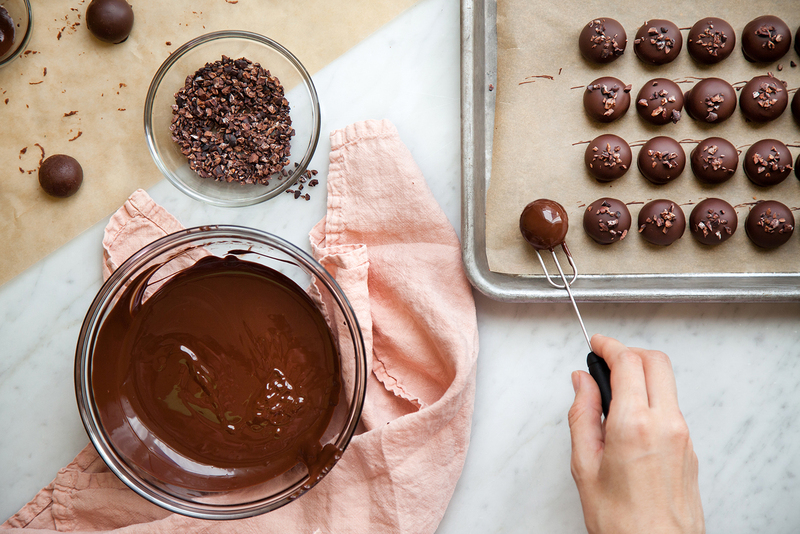 If making truffles is not for you, then that’s ok. Pick up some locally made chocolates (trust me- those chocolatiers work hard and will appreciate it). However, if you’re up to the challenge, then great! In either case, I’ve created this recipe to accommodate everyone from any skill-level. A win-win, because everyone deserves chocolates on Valentine’s Day. The truffle making process is done over a two-day period. Set aside a small amount of time from each day to complete them. First day, make ganache. Second day, dip truffles. The ganache is soft and therefore needs an overnight rest to firm up before dipping. Refrigeration to firm the ganache is not recommended. It’ll create a ganache that’s too soft to handle and work with once it returns to room temperature. Also, dipping cold ganache is a bad idea since it’ll result in too thick of a chocolate shell and cause the shell to crack. The two-day process will give the truffle superior texture and flavor. That, “Oh my goodness. It’s so creamy!” result. For these domed truffles you will need a silicon truffle mold (like this one). An alternative to using a mold is to simply cut the ganache into squares, dip, and sprinkle with nibs. If you’d prefer to skip the chocolate tempering and dipping process, then only coat the cut ganache in cocoa powder (similar to this recipe here). Both variations are included in the recipe below. Place a 54-count silicone truffle mold on a large sheet pan. If cutting ganache into squares line an 8×8-inch square baking pan with parchment paper. In a small pot, combine the cream, glucose, vanilla bean seeds & scraped pod, and fine sea salt. Bring to a boil, remove from heat, and cover. Steep for 20 minutes. Remove vanilla bean pod and place cream over low heat to keep warm. Meanwhile, combine milk and dark chocolate in a heat-proof bowl. Set bowl over a pot of 1-inch simmering water (double-boiler) and stir occasionally until melted. Remove from pot and dry off all the water from the bottom of the bowl. Pour the warm cream over the melted chocolate. Using an immersion blender, blend together until a thick ganache forms. Cut the butter into pieces and add to the chocolate. Immersion blend until shiny and smooth. If not using an immersion blender, stir ganache together by hand using a spoon or spatula. Begin with small circular stirring motions in the center of the bowl and work your way outwards as it combines. Then, stir in butter until no streaks remain. If not using a truffle mold, simply pour ganache into the prepared 8×8-inch pan. Let ganache set overnight at room temperature. 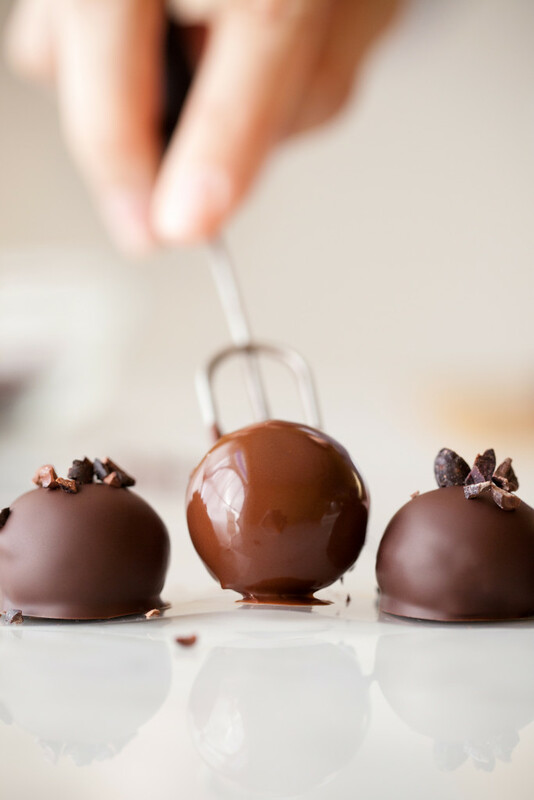 If using a truffle mold, pour ganache into a large piping bag and cut off a small tip. Pipe ganache into each mold cavity until full. Place sheet pan into the freezer until ganache is frozen solid, about 3-4 hours. Remove from freezer and quickly pop out all ganaches from mold and evenly space them on a parchment lined sheet pan. Let ganaches set overnight at room temperature. For molded truffles: Dip a finger into the tempered chocolate and swipe a thin layer of it onto the flat bottom of every truffle. This will keep the ganache from melting into the dipping fork and ensure the truffle is entirely coated in chocolate. 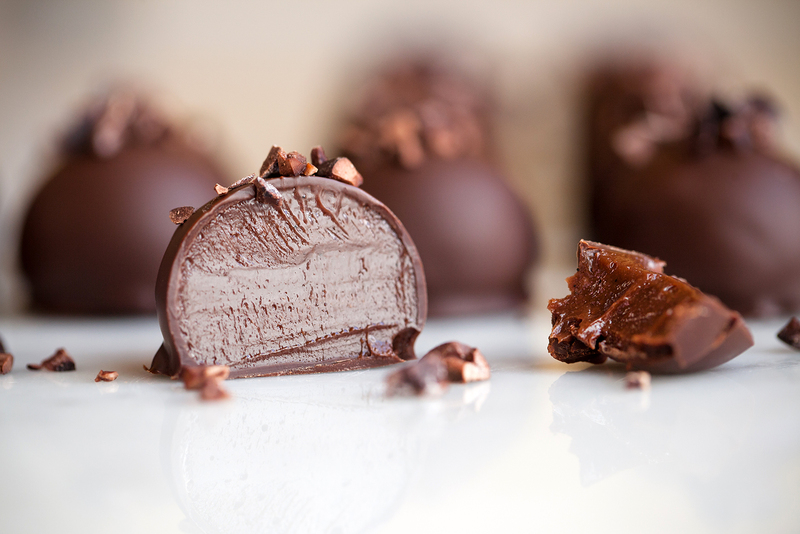 To Dip Molded Truffles: Drop a truffle into tempered chocolate bowl and gently coat with chocolate. With a dipping fork, or regular fork, locate the base of the truffle and lift it out of the chocolate. Tap the fork firmly, several times, on the edge of the bowl to shake-off excess chocolate from the truffle. Next, scrape the bottom of the fork on the edge of the bowl to remove excess chocolate. Gently tip the fork onto a parchment lined sheet pan to slide the truffle off the fork. Give it a little poke through the bottom of the fork if it sticks. Immediately, sprinkle with cocoa nibs. 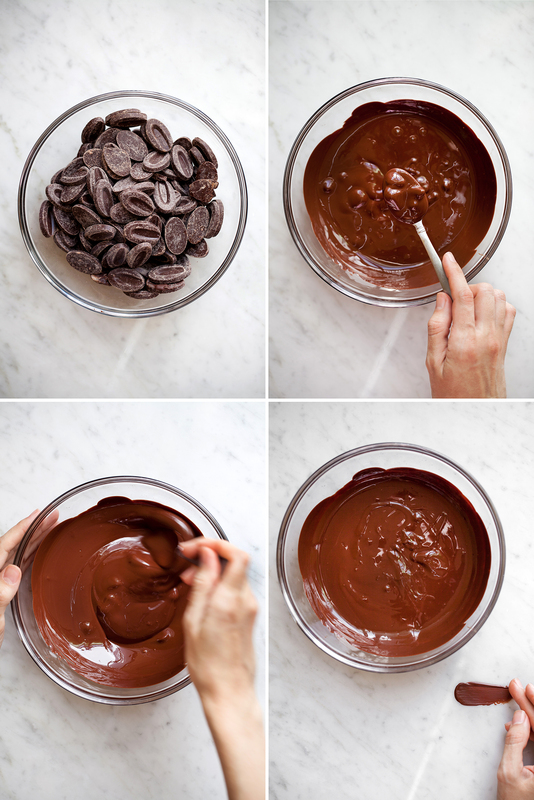 Repeat the process until all truffles have been dipped and sprinkled. Let truffles completely set for at least 2 hours before touching and eating. If you can’t wait, I won’t blame you. 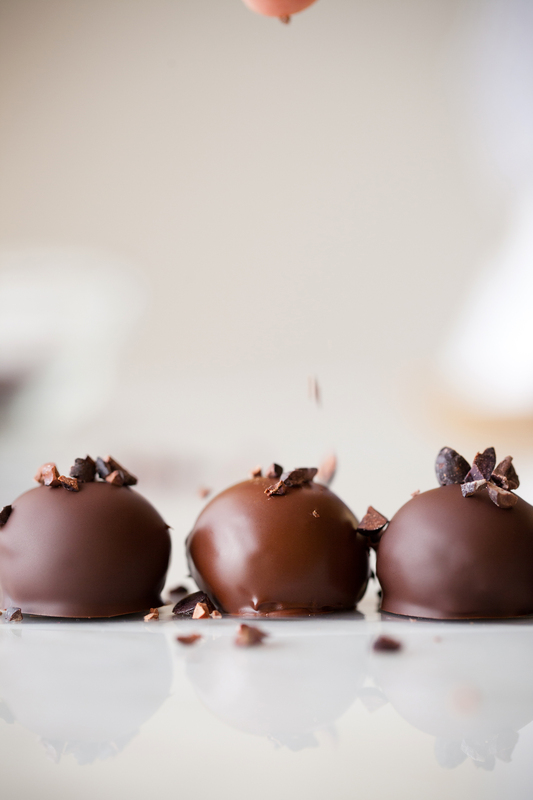 Store cocoa nib truffles in an airtight container, at room temperature, for up to five days. Ganache Squares (Variation 1): Place the 8×8-inch baking pan of ganache in the refrigerator for 10 minutes to firm up. Remove ganache from the baking pan and flip over onto a cutting board. Peel off the parchment paper. Next, spread a thin layer of chocolate over the entire bottom of the ganache (the same bottom you just peeled the parchment paper from). This thin layer will keep the ganache from melting into the dipping fork and ensure the truffle is entirely coated in chocolate. Let chocolate set and flip back over. Cut into 1-inch squares, cleaning your knife after each cut. Separate ganache squares onto a parchment lined sheet pan. Proceed with dipping. Ganache Squares (Variation 2): Sprinkle the surface of the ganache with cocoa nibs and gently press them in. Place the 8×8-inch baking pan of ganache in the refrigerator for 10 minutes to firm up. Remove ganache from baking pan, peel off parchment paper, and place on a cutting board. Cut into 1-inch squares, cleaning your knife after each cut. Roll each square in cocoa powder and lightly shake to remove the excess powder. Store chocolates in airtight container, at room temperature, for up to two days. This method is known as ‘Direct Method Tempering’ or ‘Incomplete Melting Technique’. Only use unmelted tempered chocolate for this method. Do not use old chocolate that has already been melted down and used before. All store-bought chocolate (whether chips, pistols, coins, or bars) is already in temper. This is why it’s solid, snaps when broken apart, and can be packaged without melting to the touch. 1. Set aside a small handful of chocolate. Place remaining chocolate in a heat-proof bowl and set over a pot of 1-inch simmering water (double-boiler). Stir occasionally until approximately two-thirds or 80% of the chocolate has melted. Remove bowl from pot and wipe off excess water from the bottom of the bowl. Do not allow any water to touch the chocolate or it’ll seize. 2. Stir the chocolate to incorporate the unmelted chocolate. The unmelted chocolate will cool down the melted chocolate to the proper temperature zone (providing it with the stable cocoa butter crystals that are needed for tempered chocolate). 4. While dipping, place the bowl on-top of a kitchen towel to keep it off the cold work surface. When the chocolate begins to thicken and cool during dipping, simply place it back on the pot of simmering water to warm up the chocolate (in 30 seconds intervals). Don’t heat past the ideal temperature range (for dark chocolate that would be past 92F). Stir, check the temperature, and then continuing dipping. If accidentally heated a little past the ideal temperature, don’t panic. Just stir on a cool surface to the proper temperature, test, and keep dipping. Trouble-shooting: If the chocolate is too thick and cold, after stirring in unmelted bits, place it back over the pot of simmering water. Stir until it thins (about 30 seconds to 1 minute at a time). Check the temperature and do “the finger-test” again. If the chocolate became too hot and melted out the unmelted chocolate before it cooled to the proper temperature, just break up some small pieces of the reserved handful of tempered chocolate and add a little at a time to the melted chocolate. Stir to incorporate these unmelted bits and keep checking the temperature until it reaches its ideal temperature range (for dark chocolate that would be 90F-92F (32C-33C)). Incomplete Melting Technique adapted from Chocolates & Confections. Lady, your photos are so, so beautiful. It’s such a pleasure, every time one of your posts lands in my inbox. These truffles look wonderful. Hi Cristina, thank you for stopping by to write such kind words! I’m all smiles over here. Your last post of the Cardamom-Orange & Brown Sugar Pistachio Ice Cream had me drooling. It’s a keeper. ;) All the best to you and that adorable new black kitty of yours! Thank you, Sophie! I’m such an admirer of The Green Life, so your compliments make me shine. I’d be interested in knowing if you ever create these truffles one day. They’d be perfect for adjusting into a vegan option or natural sugar (maple syrup) and you’d be just the creative mind to do it. :) Have a wonderful week my dear! Truffles are absolutely divine and I love making mine at home. Yours are beautiful and are a perfect balance of texture and sweet. No doubt, truffles are special and a process to make. Your notes on this are important. The effort and skill involved is often overshadowed especially this time of year by the abundace of these little confections when really, they are each very special, from Theobroma cacao all the way to the hands that made them (and local hands at best!). Thank you for the link to the truffle moulds.. how dreamy! I’ve always hand rolled mine… labor intensive indeed, but like you said, well worth the effort. Thank you for your sharing this through and delightful post Teresa! Thank you for your insightful thoughts on this, Traci! It’s satisfying when someone recognizes where our food comes from and how valuable that actually is. How important it is to value something well made, like chocolate, and to support it (whether locally or from a respected producer). What we eat and put into our bodies is a language to discover in itself. Why not choose something that tastes excellent and is also better for you physically? Everything in moderation. Hand rolling truffles is such a fun experience! Playing with our food always is. :D This ganache may be a little too soft to roll; hence, the cutting into squares. However, that’s the beauty of recipes. They’re meant to be altered and made personal. Grateful for your thoughts and support, dear Traci! Teresa! These are gorgeous! I’ve been such a fan of your Instagram, and am so ashamed it took me so long to pop on over to your website. Your photography is just stunning! 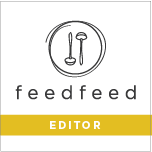 I am so enamoured by your pastry skills – taking baking blogs to the next level. I wish I had more time to practice more chocolates and pastries, but you are such an inspiration. Do these come out of the silicone mould easily at room temp? I have always made things that required freezing to unmould! THANKS! This was an amazing read and very useful. Gonna make it soon. I love your photos over at instagram! Hi Suchi! Thank you for stopping by and for the kind words. Happy to know that you enjoyed the post and my images on Instagram. 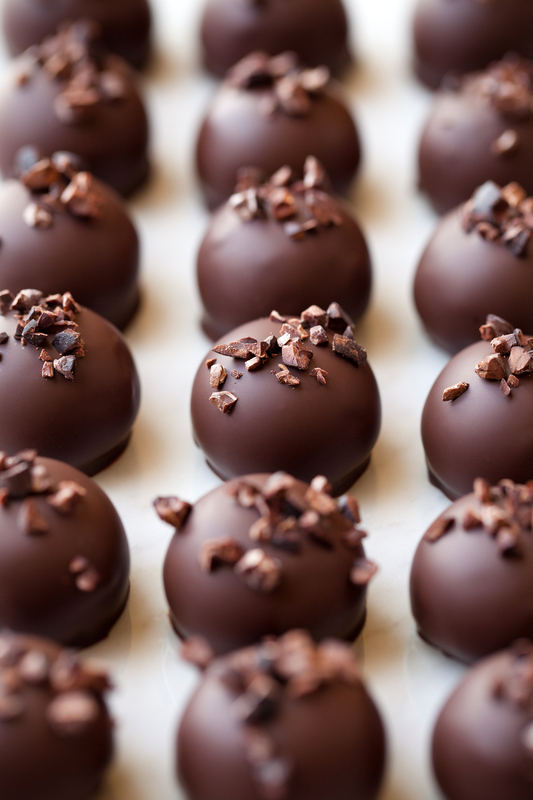 Enjoy the truffles when you make them. Have a wonderful day! Wow! I’ve made hundreds of truffles but not like this. I am so impressed with your work and how well written this tutorial is. I would love to know what brand of dipping fork you use, and where you bought it? Thank you, Kate! I’ve had this fork for several years and can’t remember where it came from. My suggestion is to try an online search for this style of fork and read the reviews. Dipping forks are all fairly similar, so it won’t be too hard to find a good one. All the best! What is the shelf life of these truffles if left in a cool place? Hi Stephanie, these truffles should last at least 5-7 days if properly enrobed in the tempered chocolate. If well stored they can last even longer. I’m choosing to provide the shorter end of their shelf life just to be on the safe side. Any cracks or uncoated spots will lessen their life span due to air exposure to the ganache.